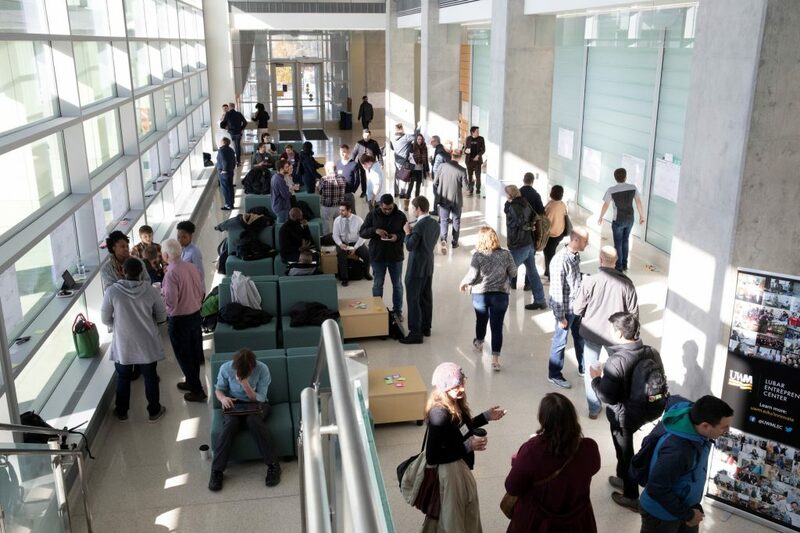 In coalition with Milwaukee Startup Week, UWM’s Lubar Entrepreneurship Center and Marquette University’s Kohler Center for Entrepreneurship hosted the third annual University Business Model Canvas Mixer on Saturday, November 10th, 2018. The event, running from 10am-12pm, brought together student and community innovators to brainstorm, refine, and collaborate on student ideas using the Lean Launch tool, business model canvas. Students from all Milwaukee schools were invited to participate: UWM, Marquette, and MSOE all saw representation. The “business model canvas” is an essential step in the Lean Launchpad startup methodology. The Lean Launchpad was created in Silicon Valley, by Stanford University’s Steve Blank. At its core, the methodology is meant to lead entrepreneurs through a series of ideation, testing, and validation of early-stage business concepts. The business model canvas itself is, generally, a large sheet of paper with nine building blocks to business, each describing a different aspect of a business model or idea. The canvas is then filled in with the assumed information and iterated upon as the startup team either validates or disproves those assumptions through cust9omer discovery. The event had a guided workshop format, led by the Lubar Entrepreneurship Center leadership team. All attendees learned about the business model canvas, and students then posted their canvases to get detailed feedback from members rotating through the crowd. Megan Carver, the Associate Director of the Kohler Center for Entrepreneurship at Marquette University was one of the mentors in attendance and also one of the co-organizers of the event. She was extremely impressed with the dedication of the students and community members that attended the event. “You can’t help but get excited and feel energized [by the collaboration at the event].” Students with fresh ideas had the opportunity to not only get perspectives from mentors at their own school but also those connected with partnering schools in Milwaukee. She’d like to see much more cross-collaboration between schools in the future. One of the students in attendance, Jack Turicek, had positive feedback to give on the event. Jack is a mechanical engineering student from the Milwaukee School of Engineering, trained University Innovation Fellow, and member of the Blue Mangoes startup team. He was excited by the number of people in attendance at the event. He said that there was great energy present and the icebreaker, a large rock-paper-scissors tournament, at the event really got people out of their seats and moving. Blue Mangoes has gone through the gBeta startup pre-accelerator program, and Jack recalls seeing successful startup teams that he connected with during that program at the event refining their own business model canvases. Local mentor, startup community member, and founder, Ed Javier, was a third-time attendee at the event. He was surprised and encouraged by the amount of growth of the event throughout the past couple of years. He even recognized students from events in past years back with new and fresh ideas to brainstorm at this one. In his perspective, a great show of success for the Milwaukee entrepreneurship ecosystem is that students, administration, and community members alike found the time on a Saturday morning to support student entrepreneurs in their endeavors. Ed noted that it was amazing to see “iconic Milwaukee institutes learning and working on entrepreneurship together.” He also had the same reaction as other attendees, that the event was very high energy and valuable for all in attendance. The connection between student entrepreneurs, educators, and community supporters is integral to the success of the Milwaukee startup ecosystem. This event was one of many in the Milwaukee community that encourages and inspires young entrepreneurs and is planned to continue in the future.